For the 22th edition, PriMed doubles its program of free sessions and gives to all public the opportunity to attend screenings of all films selected for the final phase. The screenings will be organized in Marseille from November 25th to 1st December 2018. ALL SCREENINGS ARE FREE WITH THE DIRECTORS OF FILMS! An audiovisual hub of excellence that every year presents the best of European audiovisual productions and other works of audiovisual professionals from Israel, Palestine, Lebanon, Tunisia, Egypt, Syria, Qatar, Turkey, Algeria and Morocco. 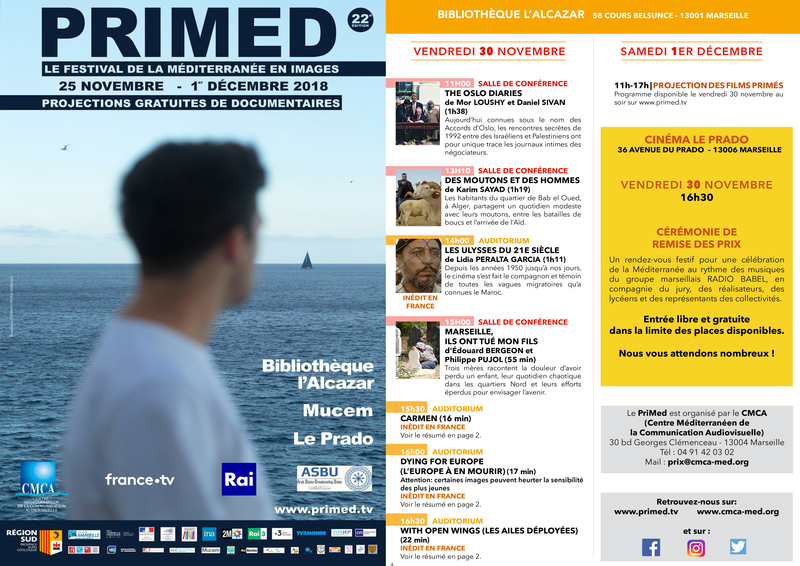 Since moving to Marseille projections for the general public were organized in three prestigious locations in the heart of Marseille: the Alcazar Library and the MuCEM, the Museum on European and Mediterrannean Civilization. Organizing public screenings indoors and outdoors, PriMed also brings together media professionals to discuss and contribute to the dialogue and cooperation between all the countries of the Mediterranean basin.